Say what? Salad for breakfast? That's right! And it is awesome! As you may have noticed the whole vegan thing didn't really work out all that well for me. A whole foods based vegan diet (void of processed fake meats and such) tends to be pretty high carb and I think that was really messing with my blood sugar levels. So I decided I needed a whole lot more protein and fat in my diet. My diet has become something that pretty closely resembles a paleo/primal type diet. Part of that has been dropping grains. So no toast, or oatmeal, muffins or waffles for breakfast. Breakfast now means eggs. Lots and lots of eggs. I go through a dozen or two every week just for myself these days. And avocado. Lots and lots of avocado. Yum! And why not get in some veggies in the morning as well? Gotta get all those wonderful micronutrients! 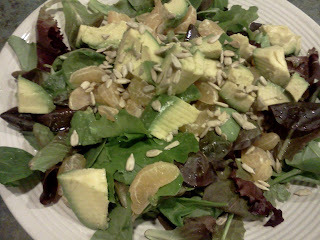 Just pile a plate high with the greens of your choice, squeeze your citrus over them and throw the rest of the fruit on there too, add the sunflower seeds and avocado then throw a fried egg or two or three on top! Let the yoke run all over your salad to combine with your citrus to make a yummy dressing of sorts. other citrus - how about grapefruit or maybe pineapple - yum! What else? 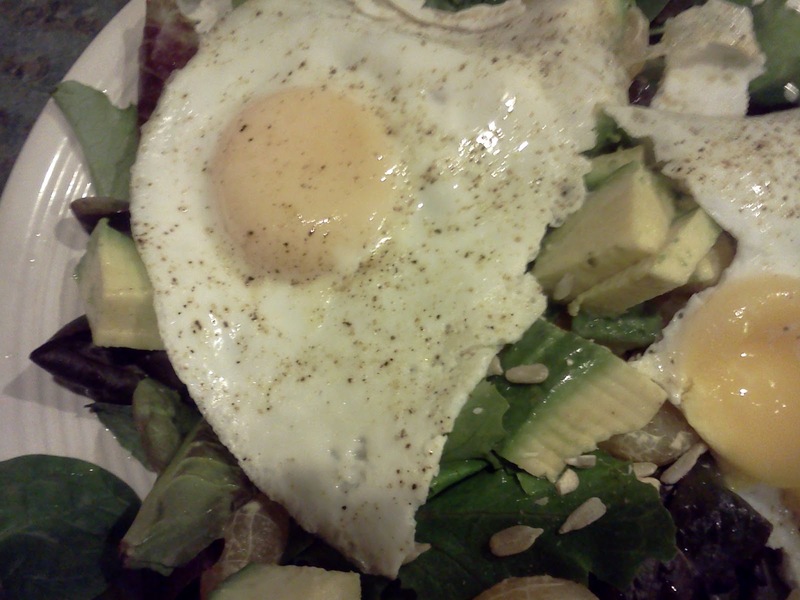 What would you put on a breakfast salad? I would love to hear your ideas!